Habesha Food, Pizza and Freshly Brewed Coffee! You must be a member of the Accra DinnerNations Group to attend this activity. Would you like to join this group? Happy New Year all, let's start the year by trying something different. 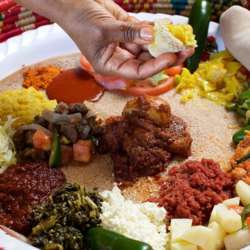 Enjoy a limited but very tasty variety of Ethiopian dishes at this local eatery run by a super friendly team. As it says in the name they also have some tasty Pizza and freshly brewed coffee for those interested. Do plan for about 50 Cedis. (parts of the menu have been uploaded to the photos). Note: This is a local restaurant with limited seats, please only click on "Attend" if you are 100% that you will be showing up. We'll try and arrange for some live music too.